Eileen Bisby describes her work as an office clerk and comptometer operator at F.W. Harmer of Norwich (a major clothing manufacturer) and elsewhere. I started work in 1957 at F.W. Harmer and company as an office junior. My mother took me down for the interview because she was determined that I was not going to work in the factory; I had to work in the office. But I found out later on that office and factory girls were the same, they just did different jobs. The work entailed arriving at 8 o’clock and we finished at 4.40. We had 40 minutes for lunch break and ten minutes for a coffee break in the mornings. No break in the afternoons. One of the jobs we had to do as an office junior, that I personally hated, was to go round the department and find out what they wanted for their coffee break – what rolls and crisps and drink. Then I had to get the money, take it down the canteen, get their orders, put it on a tin tray and have it all ready for coffee time. At 10.25 all the juniors would be standing in the canteen waiting for the tray of goods and also two enamel jugs, one filled with cocoa and one filled with tea. The girls in the department laid all their cups out and it was our job to go and fill them up. These jugs were heavy and I hated doing it and I was right glad when I moved on and somebody else had to do it instead of me. It was a large office. Open plan. The floor was concrete and in the summer it got very dusty. There used to be a lady who came round with a large galvanised watering can and she would spray the water on the floor to stop it being dusty. In the summer it was very hot. On the front of Harmer’s was a brick facade which housed all the directors’ offices but behind that there were Nissan huts for the office and factory. They used to put ‘cabbage’ water onto the windows – it looked just like cabbage water and that was what we used to call it. It was to lighten the sun so it wasn’t quite so hot. But obviously in the winter it was stone cold because of the cement floors. There was a big alteration when we had Marley tile floors put in. They were green and cream. No stiletto heels were allowed at any time in the office, so we all had to change in the cloakroom and wear flat shoes to avoid marking the Marley tile floors. Trousers were not allowed until trouser suits became more the norm and we were allowed to wear them. At one point it was decided to brighten up the office, because they were wooden desks and chairs that we had, varnished wood. They were to be painted and each department was to have a different colour. So one department had cream with blue top desks, another had green with purple. Some had yellow and purple, some had red and green. The chairs were painted as well and the wastepaper bins! And woe betides you if one wastepaper bin got into the wrong colour department. 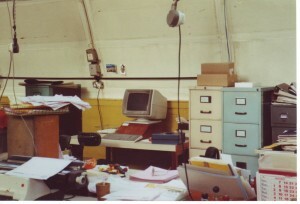 The filing cabinets were also painted, and right up to the day that Harmer’s closed, those filing cabinets were used. Every day the cashier or one of the assistants would take the money to the bank. Now that was Barclay’s Bank on Bank Plain. We were just given a Gladstone bag for the money, perhaps some cheques from people who had paid their invoices, statements or just bits and pieces of canteen money. It was all checked and I would put it in this Gladstone bag. Somebody else would get on the bus with the Gladstone bag and go down on the bus – regular as clockwork every day. No thought of being bumped on the head. Today that wouldn’t be allowed! Wages: the wages were paid in cash in those days and paid out on a Thursday. Securicor would bring the money in and the Wages Department would go and sit in the canteen and get it all ready. Certain people were picked out of the different departments to go and check the money and put it in the wage packets and seal them up. There was no security as such – a piece of wood was just put through the handle of the door so it couldn’t swing open. On Thursday afternoons we would all be given our wage packets; the factory supervisors would come into the office to pick the pay for their departments and take it back to the factory. It was all cash and that system continued for a long while. When I first started I was very nervous about answering the telephone because, in those days, the only time I used the telephone was if I went to the telephone box to phone up one of my friends who had a phone. We never had a phone at home. I was afraid I wouldn’t be able to hear who they were and I wouldn’t know what to say. So I hated it if I was left in the department on my own and the phone went. In time I got so used to it, it became second nature, but at the time it was frightening. One of my jobs was to type the blazer orders in a book, and I used to do this religiously every morning. One time I was called to the office supervisor with my book and I was told my typing looked like a donkey’s hind leg because I hadn’t kept it in a straight line. I’d just started where I thought right. Every day after that for a while I had to take my typing to the office supervisor to make sure that I had done it correctly. At the time I thought that was a load of piffle, but looking back it taught you a lesson that you had to be neat and tidy – but at the time I didn’t like it! She was a very nice lady and she always wore a nice smart costume and twinset and pearls which was the order of the day for office supervisors. Then they decided that the supervisors of all the departments would be on platforms. There was to be four blocks of desks in a department with roughly eight to twelve people and the supervisor sitting on a platform at her desk looking down on us and making sure we were doing our work. Obviously there was some chatting and laughing about it and we would get a frown and we knew we were going to have to put our heads down again. If one department was particularly naughty we’d all be trooped out for a little talk and then we’d all be trouped back in again and everyone would know you’d been told off. I don’t think that would work today but it was a good grounding. I was 15 when I started. I had to take my school reports – which I’ve still got – and when I went back they said I’d got the job. In those days they used to employ youngsters at Christmas, Easter or the summer whenever they left school. Now they all leave in one lot, don’t they? They always took on office juniors and you gradually moved up the scale. In those days there was no maternity leave. You left, and that was it and it was probably why they could employ office juniors as they did. I used to do the blazer orders and then moved on to open the accounts, which was nice. I’d send for references and making sure they were alright. I started to use Powers Samas which were punch cards with little holes. That was the onset of computers really. Next I was asked if I would like to be a comptometer operator – they were like a calculator – and they sent me for a fortnight’s training in Prince of Wales road, Norwich to do a nine-to-four o’clock course. Because it started at nine I still had to go into work first and then go on to the comptometer course but they paid for me to go and I was very grateful. In 1963 I left when I found a better job as a comptometer operator. My supervisor asked me not to go but they couldn’t match the wages – I was newly married so I left. My new job was with Power petrol which was a part of BP. They were opposite Thorpe Station and I worked as the comptometer operator there. I stayed until I started my family so I had a little break from employment. I decided – well I needed a little more money – so I did a stint of ‘sprouting’ for Bird’s Eye. This involved cutting the stalks of the sprouts which then went into a vat then you started on another bag. I did it for a little while because it worked in with having the children. I then worked for a shoe factory doing interlacing at home – it was hard work and if you split a shoe you had to go back and tell the lady – you literally shook in your shoes! In 1971 I went back to Harmer’s. They came round to see me and I said I would like to go back and do export for the Irish Republic. I greatly enjoyed getting the orders sorted, making sure the goods were shipped out, getting the paperwork signed to go through customs and making sure they paid. I did it until 1980 and then my friends who had a business running a café, asked if I would like to go and work with them. I thought, “That would be nice, that would be a change”. So once again I put in my notice only to find that friends and business don’t work. It’s hard to draw the line between being a boss and being a friend and also being an employee and a friend. So that didn’t last long. I did various temporary jobs round the city working as a comptometer or doing clerical work, whatever was needed. Then one day when I was in the city, the cashier at Harmer’s saw me and said, “Hello Eileen, what are you doing now?” I said, “I’m doing temp work at the minute,” and she told the supervisor who asked if I’d like to come back. So back I went. I did a spot in Wages – it was funny really, because the supervisor in Wages wanted a week’s summer holiday so I was asked to do the wages. In those days we had a factory in Fakenham, another in Wayland as well as the factory and office in Norwich. They said, “You’ll be fine.” Another comptometer operator was going to help me but I’m a worrier and wasn’t sure I could it. But I did, and by the end of the week I’d balanced all the books, done the wages and paid it all out – lovely. So then I went to my office supervisor and said, “I think we deserve a little bit of extra money.” She said, “Well, I don’t know about that, Eileen,” but she said she would ask Mr Westwell, and I said, “If not, I’ll ask him.” When she came back I was given a bonus of £15 and the other young lady had a bonus of £10. “Well, thank you very much,” I said. 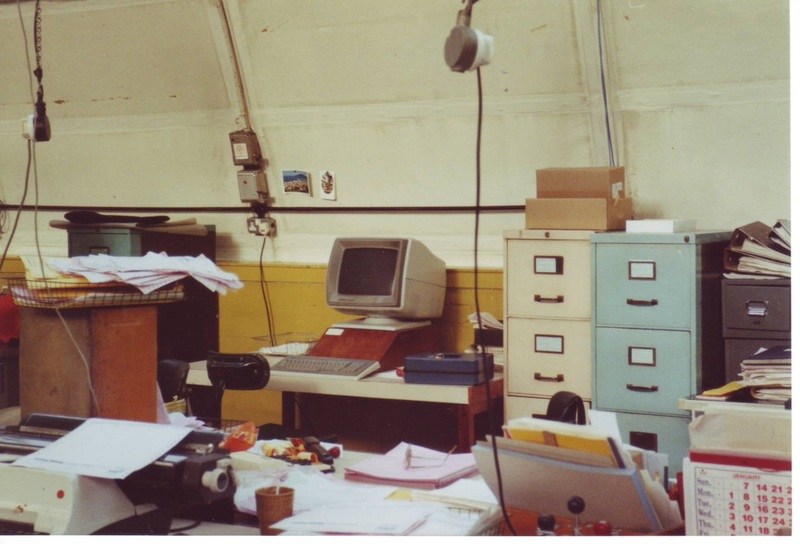 I was a bit of an office clown perhaps; I was always the one who would do a bit of mucking about – I’m the first to admit it! When anybody was ill they would go to the cloakroom and we’d tell the office supervisor so she could try and sort it out. One particular day I got hold of a long mop, cut a face out of a magazine and put it on the mop with her name on it and stood it in the cloakroom. I told her that someone in the cloakroom wanted to see her. She took it all in good part because she knew what I was like. Christmas time was nice. We used to decorate our departments and one year there was a prize for the best one. I think it was a box of chocolates to share. 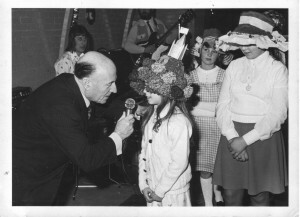 There used to be a Christmas party for the children and one of the gentlemen would dress up as Father Christmas. The children would get a little bag with an orange and sweets, and a tea party. At Easter the children had an Easter bonnet competition and my two little children were quite lucky and used to win; I was asked if I wouldn’t do any more hats – which was quite funny! My last job there was as the credit controller. It was very interesting and involved getting the statements and invoices out. Monthly statements used to go out to every customer. They’d send the cheques in and sometimes they would pay a lump sum. I had to work out what invoices they had paid or what balance they’d paid off another invoice. I’d write letters if some were a bit irregular or overdue saying, “No more goods until you pay up”. The names of the shops were confidential – you’d never tell anybody if they were good payers or not because that wouldn’t be correct. We were told we had to keep that to ourselves. Looking back, we were all one big family. There was great camaraderie with the girls. Some of them I still see today and I’ll say hello to the supervisor. I really enjoyed my days at Harmer’s. They weren’t the best payers, but they were always very good to me. At one point I had a ‘comp’ at home and I used to do the work for them at home. That would have been about 1969 or 1970 and I was fortunate because where I lived the young girl next door worked in the typing pool so she used to bring the work home in the evening and I used to give it back to her in the morning to take back. 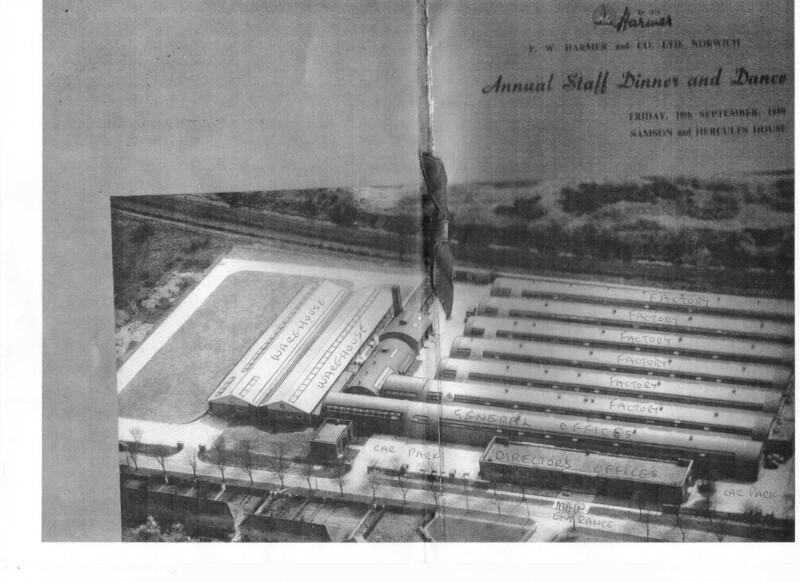 What products were made at Harmer’s? They made different coloured school blazers for different schools and they had an embroidery department which was used to do the different embroidered badges. They made all the Post Office uniforms and Fire Brigade uniforms and trousers and jackets and suits for gentlemen. Then they went into ladies’ slacks as well and children’s trousers. I was very fortunate as I could get my son his trousers there. I remember one time we made blousons that looked like a lumber jacket like the Beatles had. I can remember one of the directors coming into the sales department where I was working at the time and saying, “Eileen, how are the ‘blooson’ orders going?” And I said, “Oh, the blousons?” He looked at me and I said, “Well you say tomaytoes and I say tomatoes.” With that he walked off. The clothes were very good quality. I used to go into the factory and see the girls on the presses – they must have been boiling in the summer – and there were cutting rooms were the cloth was cut out, the cloth store and the button store. I found it very friendly. The girls were alright and not different to us as Mother would say. I think she was a bit Victorian. So they made blazers and suits and men’s trousers and for Northern Ireland we made them for Marks and Spencer. In the Irish Republic we couldn’t put, ‘made in England’ tabs on them because of the troubles there at the time – the shops could have been bombed. I worked for Harmer’s until they closed – it was sad really. There were about four of us left in the office and I was fortunate enough to be one of the last because credit control had to get the money in. We just sort of rattled around in there. We watched all the machinery go and it was all a bit bare and sorry for itself. I can remember one particular day when a lovely, thick pair of corduroy trousers was returned – people used to send back goods like you would if you bought in a shop. Well, at the time my dad was alive, and I thought he’d have loved a pair of them. So I asked the director if I could have a couple of pairs of the returned trousers and he wanted to charge me for them. I said, “If you can’t give them to me after all this time…” “Oh take two pairs. I hope whoever employs you, you’ll not be so much trouble!” he said. They closed in 1990. I finished in May and I think they went on till July. It lay dormant for a while. The original office was in St Andrews but that was bombed and it eventually moved to Havers Road in 1947 where Nissan huts were put up. I should imagine they were supposed to be a temporary thing but they stayed and had a brick facade put on the front. I worked on the switchboard for a while. There’s one in the Bridewell Alley museum just like it. I remember a certain director who expected an outside line to be cleared if all the lines were engaged – you had to pull one out very quickly because he always had to have a line straightaway. Looking back, we were all one big family. There was great camaraderie among the girls. I still see some of them today and I say hello to the supervisor. I really enjoyed my days at Harmer’s. They weren’t the best payers, but they were always very good to me. About 1969 or 1970 I had a ‘comp’ at home and used to do work for them at home; I was fortunate as the young girl next door worked in the typing pool and would bring the work home for me in the evening and I returned it to her in the morning. Harmer’s made coloured school blazers for different schools and they had an embroidery department which did the embroidered badges. They made all the Post Office and Fire Brigade uniforms as well as trousers, jackets and suits for gentlemen. Later on they made ladies’ slacks and children’s trousers. I was fortunate as I could get my son his trousers there. I remember one time we made blousons that looked like a lumber jacket, like the Beatles had. I can remember one of the directors coming into the sales department and asking how the ‘blooson’ orders were going. I said, “Oh, the blousons?” He looked at me and I said, “Well you say tomaytoes and I say tomatoes.” With that he walked off. The clothes were very good quality. I used to go into the factory and see the girls on the presses – they must have been boiling in the summer. There were cutting rooms where the cloth was cut out, the cloth store and the button store. I found it all very friendly. The girls were alright and not ‘different to us’ as Mother would say. I think she was a bit Victorian. In Northern Ireland we made blazers and suits for Marks and Spencer but in the Irish Republic we couldn’t put, ‘made in England’ tabs on them because of the troubles – the shops could have been bombed! I worked for Harmer’s until they closed – it was sad really. There were about four of us left in the office and I was fortunate enough to be one of the last because credit control had to get the money in. We sort of rattled around watching the machinery go; it was all a bit bare and sorry for itself. I remember one particular day when a lovely, thick pair of corduroy trousers were returned – people used to send back goods like you would if you bought in a shop. Well my dad was still alive and I thought he’d love them so I asked the director if I could have a couple of pairs of the returned trousers and he wanted to charge me for them. I said, “If you can’t give them to me after all this time…” “Oh take two pairs. I hope whoever employs you next, you’ll not be so much trouble!” They closed in July 1990 and I finished in May and then the building lay dormant for a while. The original office was in St Andrews but that was bombed and the factory eventually moved to Havers Road in 1947 and into Nissan huts. I imagine they were supposed to be a temporary thing but they stayed and had a brick facade put on the front. I worked on the switchboard for a while; the Bridewell Museum has one just like it. I remember a certain director who expected an outside line to be cleared if all the lines were engaged so you had to pull one out very quickly so he had it straightaway! They were the forerunner of the calculator. They had keys, one to nine, in rows; the even numbers were flat and the odd numbers had an indentation so you didn’t need to look at it as you worked. It was a very clever machine which you used to add, subtract, multiply and divide. It could do tons and hundredweights, which we needed, and yards, feet and inches. If you had 125 times 125, you would hold down the keys, one, two and five in the horizontal row i.e.125 and then you’d press it five times. Then you’d move to your left and press it two times, then you’d move to your left again and press it once, and that would give you the answer. I gave my comptometer to the Bridewell Alley museum – it wasn’t mine but when they were clearing things I asked if I could have it and I kept it for a long while until I lost the lead. The first ones were operated by hand but then they moved onto electric ones where you just pressed the keys and they automatically rolled it out for you. They got newer and newer models. They were used to calculate wastage with the cloth and for adding up wages and any deductions. Only the supervisor was allowed to do the office wages because they were very secret. Nobody was paid the same. On birthdays we would get two and six or five shillings, and twelve and a half pence or twenty five pence as a pay rise. We did all the stocktaking cards on the comptometers as well. There were six of us on the comptometers and the lady who was my old boss went out with me once a month, rock and rolling! The comps were already there when I started. We worked in decimals and had decimals of a pound and a shilling. I can remember that 11 pence was .8333 recurring. Another one was 0.125 – if I remember rightly that was 6 pence. We had a little card listing the decimals of a pound, or reciprocals as they used to be called, and we had to learn the decimal tables to do some of the calculations. The training involved being given different sums such as adding up, and I think I am correct in saying I learnt what Harmer’s wanted me to learn. There were many different sorts of people from all walks of life on the course. Every Friday we had a test and I remember my husband-to-be helping me to learn the decimals as written on the chart. He’d say, “What is the decimal of this?” You learned them off by heart like a times table. Calculators are alright today, but they don’t do what comptometers did but computers can – you put the information into the computer and it works it out. We had to learn to hold a pencil under our thumb so we could go along not looking at the keys because we felt them; we had to learn where they were – I wish I had a photograph. There was one key at the end for the 10 shillings, then there were the keys for the other shillings, the pence and then the halfpenny – we dealt in halfpennies then. Unfortunately the comptometer in the Bridewell museum is not on show. I went last year when they had the Heritage Open Days and they had information on Colman’s and Bally’s but nothing about Harmer’s. I said to the young man at the desk that there was nothing about Harmer’s, a big factory in its day, and I mentioned that the comptometer wasn’t on show.” He said, “Never heard of them.” I suppose a lot of people haven’t; Harmer’s closed twenty five years ago and it’s all been knocked down. They employed a lot of people and a lot of Italian ladies who came over during the war. Some were very skilled on the machines, very skillfull indeed. My first wage was two pounds two shillings and six pence which was £2.12 and a half p. They got my first pay packet wrong and I remember going into the cloakroom and asking a young girl who used to be in my class and started with me, how much she had been paid. I realised I’d been given too much but they made me keep it because the system meant that a mistake was corrected the following week. After I left Harmer’s I went across the road to the City Works and did some temping in the afternoons in the bonus office. I was there about 11 or 12 years until I retired at age 61 in 2003. It’s been pulled down as well but whether that’s something to do with me, I don’t know! I lived off Reepham Road and lots of us biked to work, but if you were a bit late there wouldn’t be a free bike rack left as they used to be chockablock. People who lived in the country had coaches to bring them to work; Cullings Coaches used to come and take them home. I was fortunate. If it snowed, I could always walk asI lived in the vicinity. The buses weren’t too bad if I remember. The food was very nice – they used to make lovely fruit pies and rolls. I can taste them now. You’d go down at dinner-time and wait in the queue, not an orderly queue because we’d all be shouting out what we wanted. “I’ll have a fruit pie, I’ll have a fruit pie…” I remember a lovely mural on the wall in the canteen depicting different scenes. When I worked in the canteen, the things I didn’t like were taking the orders and carrying the big enamel jugs and pouring out. Later on we didn’t have to do it because people drank more coffee – more up market! The front office used to have a tea break and their tea was brought to them in white china cups. When we did overtime until seven o’clock, an extra two hours, we’d get a free tea and there’d be things like sausage and eggs. If you stayed for an hour you got tea and biscuits. Was there any health care? Yes, there was a Sister who had a little room and you could go down and see her. There was a bed where you could lay down for a while. If someone was ill you would ring her up and she would come with a wheelchair. We’d say, “Here’s Boadicea with her chariot.” She’d plonk you in it and off you’d go. There was a hairdresser’s so you could have your hair washed and set. You were allowed so long to have your hair done if you wanted it. They had a netball team and I played a couple of times. I liked the game but I wasn’t very good at it. They didn’t have a social club. 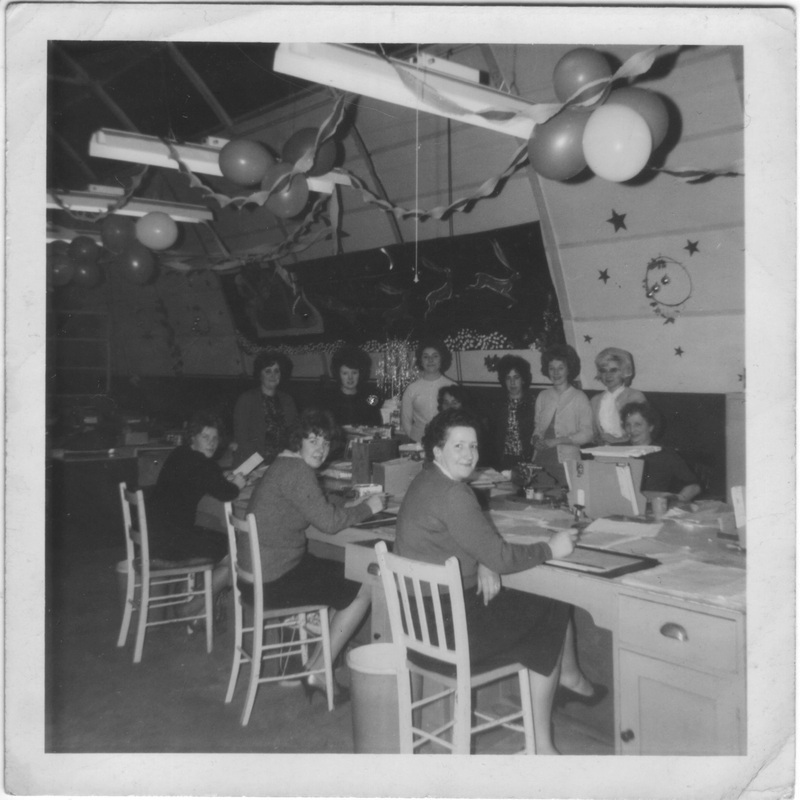 They had a dinner dance once a year and the supervisors had dinner – the ordinary staff could only go to the dance. It was held at the Samson and Hercules and I think the supervisors had their meal in the Flixton Rooms before they came down. The Reps that went round the various towns used to come for it as well. They’d come in and talk to some of the office staff. I can remember when the hula hoops came out, we used to have a hula hoop in the office. It was a friendly place and I do still see two or three around and say hello and have a little chat. Harmers were a big employer. The office was very big when I first went to it. As different systems came in, they didn’t need so many staff. When anybody got married, you would decorate the chair with L-plates and trim the desk but we were told not to do anything naughty! How much holiday did you get? We had Christmas Day and Boxing Day. We worked Good Friday and I think got the Tuesday off. Then we had a fortnight’s summer holiday which was taken when the factory shut in August. That caused a lot of controversy – not so much for the single girls but some husbands couldn’t get an August fortnight – mine couldn’t so I didn’t want it. If you worked in departments that were solely within the factory – like the bonus department which dealt with the factory side of the work – they had to take the fortnight off otherwise there would be nothing for them to do. But if you worked in, credit control or such like, you could perhaps squiggle in because you weren’t affected so much by the factory being shut. I didn’t want the August holiday so I suggested I have the two weeks off without pay. That went down like a lead balloon. But I must admit I always got the holidays that I wanted. You worked at the Stationery Office as well. About 1970 I went as an office temp. It was in St Crispin’s on the roundabout and I worked in Print Procurement (PP) doing the invoices. I enjoyed that, but then I had to move on to another department, and to keep the job, I had to have two O levels. So I decided to go back to school and I sat O-level English. I didn’t want to do literature because they were doing The Tempest and I wasn’t into that. This was in 1971. But Maths was out for me – I could understand adding up and different bases and matrices and I could understand percentages which were easy but I couldn’t do algebra – I couldn’t see the logic in it at all. I used my multiplication tables every day of my working life and I still do and I don’t need a calculator – unlike like people now. I couldn’t stay at PP because I didn’t have two O levels. I was up for Clerical Assistant but they changed the job title to Clerical Officer although it was the same work and they changed the qualifications to five O levels. I knew I’d never get five O levels – I was well into my forties at the time – and I didn’t have the inclination. So I taught my job to a young girl who had five O levels and I retired gracefully from the Stationery Office. They said they were very sorry they couldn’t keep me but that was the ruling. They bought me a crystal glass bowl when I left. Eileen Bisby (b. 1942) interviewed in Norwich for WISEArchive on 10th June 2015 .